Share the post "How Some Algae May Survive Climate Change"
This image shows the cell structure of Picochlorum SE3, which was isolated from the San Elijo Lagoon in California. This species has exceptional resilience in coping with light and salt fluctuations in its natural habitat. Green algae that evolved to tolerate hostile and fluctuating conditions in salt marshes and inland salt flats are expected to survive climate change, thanks to hardy genes they stole from bacteria, according to a Rutgers-led study. 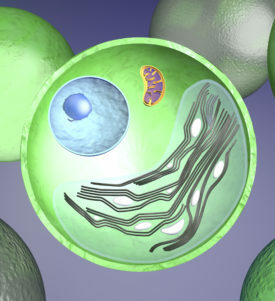 These Picochlorum single-celled species of green algae provide clues to how nature can modify genomes, and suggest ways in which scientists may someday engineer more robust algae to serve as biofuels and provide other benefits, according to senior author Debashish Bhattacharya, distinguished professor at Rutgers University–New Brunswick. The study appears in the journal Molecular Biology and Evolution. The findings reveal how the miniaturized genomes of green algae have evolved from the larger genomes of their freshwater ancestors to become resilient primary producers of organic compounds that support ecosystems. This transition to a saltier and more hostile environment achieved by Picochlorum occurred over millions of years but parallels what is happening on a more rapid scale now due to climate change, said Bhattacharya, who works in the Department of Biochemistry and Microbiology in the School of Environmental and Biological Sciences. Lead author Fatima Foflonker, who earned a doctorate from Rutgers’ School of Graduate Studies and is a post-doctoral researcher at Brookhaven National Laboratory, discovered that Picochlorum species of green algae stole genes from bacteria, allowing them to cope with salt and other physical stresses. Foflonker found that one Picochlorum species has among the most stable photosynthetic processes known for splitting water to release oxygen. This species works efficiently in rapidly changing low- and high-light levels typical of turbid near-shore environments or shallow water ponds in the high plains of the United States. Another species isolated from the Salt Plains National Wildlife Refuge in Oklahoma keeps two very different copies (alleles) of about a third of the genes in its genome to increase its range of responses to environmental stress. Understanding how microalgae adapt to rapidly changing environments can help clarify the potential impact of climate change on the biology at the base of the food chain, the researchers say. Next steps include developing robust Picochlorum species as biofuel feedstock and as targets for genetic engineering to produce bio-products. Such work is underway at the U.S. Department of Energy and various research labs. These species have been studied for potential use in remediating wastewater, producing biomass and serving as feed in aquaculture, the study notes. Using genetic tools, scientists have already manipulated one species to increase lipid production. This story originally appeared in Rutgers Today.